Pectoral cross - A78 (with chain) - Istok Church Supplies Corp. 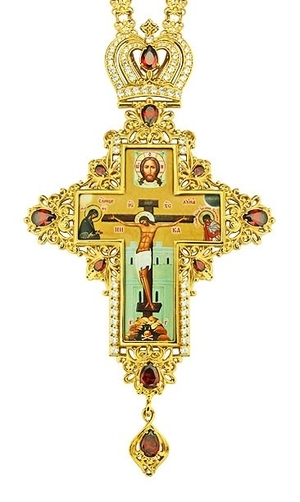 Orthodox clergy pectoral cross of a rather large size is made of brass and covered with 24K gold-gilding, galvanized. A very large crucifix is ? ?made using a special technique for applying a color image to a brass base, it is coated with a composition that protects it from mechanical damage and exposure to light. The voluminous floral ornament around the Crucifix is ? ?decorated with inserts of excellent quality stone-phianites, fixed by hand, which guarantees their being in their places for the entire period of wearing the cross. To the cross there is a matching panagia with SKU PGA-0462LP-2.